As medical technology becomes more patient-focused and remote management more prevalent, GlobalLogic decided to develop a proof-of-concept called the Diabetes LogBook that would enable patients with diabetes to easily monitor and share their health data with those following their condition. Although the market currently offers similar applications, we wanted to develop a potential solution that would (1) wirelessly capture additional physiological data points, (2) enable cloud connectivity, and (3) integrate with several mobile healthcare platforms. 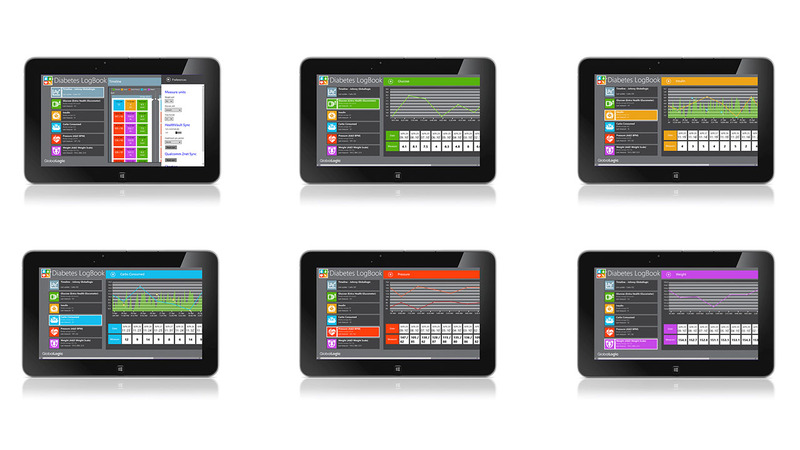 We also chose to build the Diabetes LogBook on the Windows 8 platform so that we could experiment with emerging user interface concepts (e.g., Metro Design Language). The Diabetes LogBook collects, analyzes, and shares data about a user’s glucose levels, insulin levels, carbohydrates consumption, blood pressure, and weight. Each parameter is color coded, and users can display multiple parameters over a single timeline to identify important trends. For example, a user can see how a decrease in the amount of carbohydrates they consume impacts their glucose levels and insulin dosing. Users can then share this data with their clinicians or authorized friends or family members through a number of connected platforms (e.g., Microsoft HealthVault, Qualcomm 2net, AT&T mHealth). Although we built this prototype on the Windows 8 platform, it could easily be adapted for iOS or Android native applications or within a web browser using HTML5. The app integrates with Qualcomm 2net, AT&T mHealth, and Microsoft HealthVault to access biometrics that are collected and/or stored in these systems. The Diabetes LogBook can also connect to a user’s Continua-compliant medical device through a variety of gateways (e.g., Qualcomm 2net Hub, mobile phone, cellular-enabled medical device), or users can manually enter their data using a Windows 8 computer, Windows RT tablet, or smartphone. The app syncs to 2net, mHealth, and HealthVault over the cloud, and it pushes collected data back to HealthVault or mHealth for storage within the provided Personal Health Record (PHR). In addition to creating the user experience and interface for the Diabetes LogBook, GlobalLogic also designed, developed, and tested the software implementation for the application. The entire process took approximately six weeks leveraging a single Windows 8 developer based in Ukraine. This prototype is part of a larger initiative within GlobalLogic to respond to the market’s growing drive to enable remote patient management and to put important medical data directly into the hands of the patient.